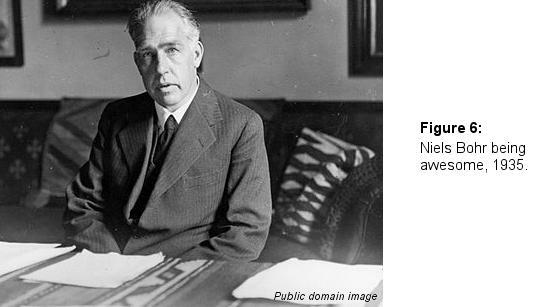 We continue our exciting whirlwind tour of atomic history with a story about Niels Bohr and his planetary model of the atom. As in the first two sections of the atomic history tutorial (Part 1, Part 2), this section will contain occasional links to a footnotes page that contains further information, should you be interested in such. If you’re not, don’t worry about it – it won’t harm your brain to miss out on it. The stuff you heated up glows and, if you look at it through a prism, it makes a pretty rainbow (this is called a continuous spectrum). The stuff you heated up glows, but glows in some particular color. If you look at the light through a prism, you find only a couple of bands of color and a whole bunch of nothing. This is called a line spectrum. It seemed weird to a lot of people that various things would behave differently when heated up.¹⁴ Because people don’t like to be confused, they decided to investigate these phenomena. The first category of stuff (the one with the continuous spectrum / rainbow) is known to be something called blackbody radiation. Essentially, everything gives off electromagnetic energy whenever it’s at a temperature above absolute zero, and this energy is related to how hot the object is. As a result, you can feel energy being given off by a piece of hot glass in the form of warmth, and you can see energy being given off by hotter glass in the form of light. Cool things give off most of their energy in wavelengths we can’t see (which is why you don’t see the sidewalk glow on a hot day) and very hot things give off their energy in visible wavelengths (like the coils in a toaster). When this process occurs, a wide range of energies of EM radiation are emitted, causing very hot things (such as incandescent light bulbs)¹⁵ to give off continuous spectra if you break the light apart with a prism. The second category of stuff, on the other hand, was pretty weird. It had something to do with atoms, but nothing that made any sense given any of the existing models of the atom. Protons and neutrons live in the nucleus of the atom. They already knew that. Electrons orbit the nucleus in circular orbits called orbitals. (This model is sometimes called the “planetary model” because the electrons were perceived as travelling around the nucleus like the planets travel around the sun). The energy of electrons increases as the orbitals move further from the nucleus. Put another way, electrons near the nucleus have less energy than those further away. Orbitals can only exist at certain distances from the nucleus, and not at others. As a result, electrons can only have certain amounts of energy. These certain amounts (let’s call them “quantities” are referred to as “quanta.” You’ll learn about the mechanics of these later. Everybody listened to this for a second and thought that was pretty good. Then they looked at Bohr and asked him what he was talking about. 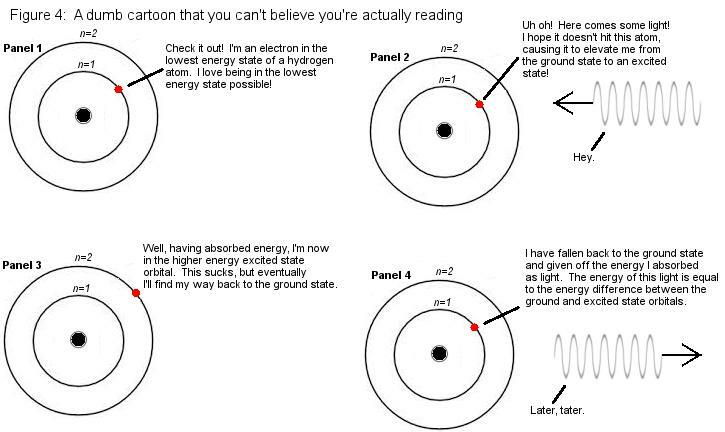 Bohr went on to explain how his model was awesome, and how they were all a bunch of morons for not getting it. As it turns out, they were both right. Under normal circumstances, electrons like to hang out in the lowest-energy orbitals possible (called “ground state” orbitals).¹⁶ In the case of hydrogen, which has one electron, the ground state orbital is the one nearest the nucleus. If you add energy to an atom, the energy gets absorbed by the electron. Because it now has higher energy than it did before, it moves further away from the nucleus into an orbital with higher energy (called an “excited state” orbital). Eventually, the electron gives off the energy it absorbed and falls back down to the ground state. Where does all that energy go? It is given off as light that has exactly the amount of energy as the difference between the ground and excited state orbitals. And thus, you have a single energy of light, corresponding to a single color of light, given off. Hydrogen has many possible excited states. As a result, you don’t just see one line, but a whole bunch of lines that correspond to the differences in energy between all of the orbitals. This is why line spectra have more than one line. All elements have unique line spectra because all elements have different allowed energies for the ground and excited states. This makes it possible for us to identify elements based on their line spectra, a process known as spectroscopy. There’s a whole tutorial about spectroscopy, so check out the menu on the right side of the page to see more. Or, if you don’t like doing a lot of reading, you can just say that Bohr explained spectra. Not too bad. Another feature of Bohr’s model is that he made it mathematical. Instead of simply saying that “electrons in an atom have certain allowed energies and emit light in quanta related to these energies, so let’s have pie”, he was able to come up with equations that explained these energies. In 1922, he won the Nobel Prize for figuring this stuff out. It represents a work in progress. At this point in history (the late 1910s), everybody was frantically working together to figure out what the heck was going on in atoms. Though the Bohr model wasn’t right, it was such a huge leap forward in what people understood that it was still pretty awesome. It’s basically true. OK… electrons don’t travel in circular orbits and their energy is way more complicated to understand than just the distance from the nucleus. However, the idea that electrons only exist at certain energies and that they can move from one orbital to another are both 100% right. It explains spectroscopy. If you want to identify something, compare its spectrum to the spectra of known compounds. If they match, you’ve identified the mystery material. It allows us to visualize complicated things. Electrons start out in ground states, move to excited states, and then give off light when they return. Though the electrons aren’t actually jumping up and down, their energies are increasing and decreasing as this happens. 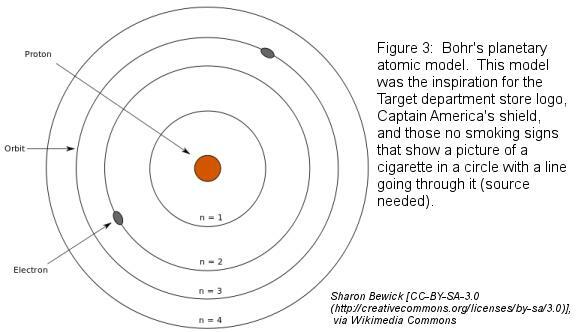 The Bohr model, though incorrect, allows us to visualize what’s happening more easily. Thus, we have evidence that it’s good to work hard and come up with excellent theories, and that it’s still good to have excellent theories, even if they aren’t exactly right. This should give the slackers among you hope that one day, you too might win a Nobel Prize. But probably not. Good video about Bohr (and other atomic stuff): Early History of the Atom: There’s a lot of great stuff here, plus it’s pretty pleasant in tone. A nice change from boring videos.